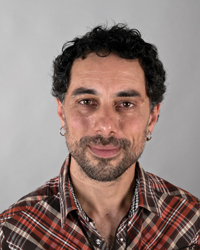 Sean Feit Oakes, PhD, teaches Buddhism, Hatha Yoga, and Organic Intelligence® with a focus on the integration of meditation, philosophy, and self-inquiry with trauma resolution and social justice. He has studied in Zen, Tibetan, and Theravada Buddhist lineages, including training as a monk in Burma, and is authorized to teach Insight Meditation by Jack Kornfield. In yoga, he began in Ashtanga, studying with Larry Schultz and Alice Joanou, did teacher training with David Moreno in the Bihar tradition, and Buddhist integration through the Spirit Rock Mindfulness Yoga and Meditation (MYMT) program. Other primary teachers include Eugene Cash and Sylvia Boorstein (Insight Meditation), Anam Thubten (Mahayana), Sayadaw U Janaka (vipassana), and Steven Hoskinson (Somatic Experiencing, Organic Intelligence®). Sean teaches at Spirit Rock Meditation Center, East Bay Meditation Center, and Namaste Yoga + Wellness, and is core Yoga Teacher Training faculty (E-RYT 500) for Piedmont Yoga and Spirit Rock. He works with teens through Inward Bound Mindfulness Education and is Associate Faculty with Organic Intelligence®, focusing on the integration of mindfulness with trauma resolution. Sean received his PhD in Performance Studies from UC Davis in 2016, writing on states of consciousness in Buddhist meditation and experimental dance. He lives in Oakland with his family and beloved community.